Would you like to see your child show interest in the arts? Violin is a fine art that requires much skill. It can be hard to master, but once your child gets the hang of it, they could be unstoppable. When you think of the violin, you might be expecting it to be way too complex for young children. However, children are quick learners. If you’re considering a violin for your potentially budding musician, you came to the right place. We’ll go through everything you should know before buying, and we’ll share some of our favorites. Let’s go. Use the links above to check the latest prices or read our in-depth kids violin reviews below. When buying a violin, it’s important to consider your child’s age, abilities and how serious they are about playing the instrument. Maybe it’s only going to be an after-school activity, or it could potentially develop into more. Let’s look at age-appropriate features and other specifics to keep an eye out for when making this special purchase. For the youngest aspiring violinist, simplicity is everything. You want your child to have a fun sensorial experience by feeling, hearing, and mimicking the movements. It doesn’t have to be a real violin if you just want to introduce them to the instrument. Some toy violins will have fun features like music, lights, and sounds. The important thing to keep in mind is your child’s abilities. 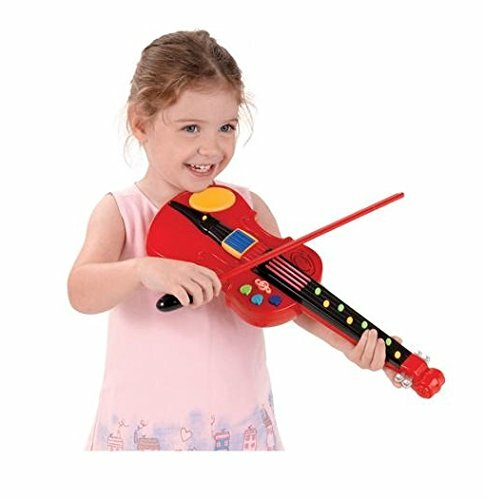 Some toddlers might love a realistic-looking toy violin, while others will enjoy the fun features of an obvious toy. If your child shows a genuine interest in taking up this instrument, they need a real violin to help them along. A student violin is usually made from a good-quality wood, but components like the pegs and chin rest may be plastic. It might be wise to look for an intermediate violin if your child is advancing quickly. These are of a better quality than the student types. The pegs and chin rest are usually made of ebony or similar materials. Synthetic core strings: These are easier to play than steel. The correct size: a violin that’s too big can’t be played comfortably. A good tonewood, such as spruce or maple (source). For bigger kids, a student violin won’t cut it, which means it could be time for a true, professional instrument. If your child is playing on a more serious level, there might be performances coming up, or other great milestones. High-quality strings: Such as D’Addario Prelude. Good volume and projection: Important for performances. Craftsmanship: Select quality material (like maple) and varnish (antique). To measure, ask your child to extend their arm. It’s important to extend it the same way you would when holding a violin. Measure from the base of the neck to the center of the palm. This gives you an indication of which violin size is best for your child (source). For those in between sizes, ask yourself if your child will be hitting a growth spurt anytime soon. If you’re unsure, it’s good to seek advice from a tutor or a violin shop. It’s easier to play a smaller violin than one that’s too large. If it’s difficult for your child to hold, it could be frustrating for them to learn. As with so many other instruments, there’s the choice of acoustic or electric. However, for beginners, an acoustic is the best place to start. Easy to set up and get started. Good for home use and lessons. 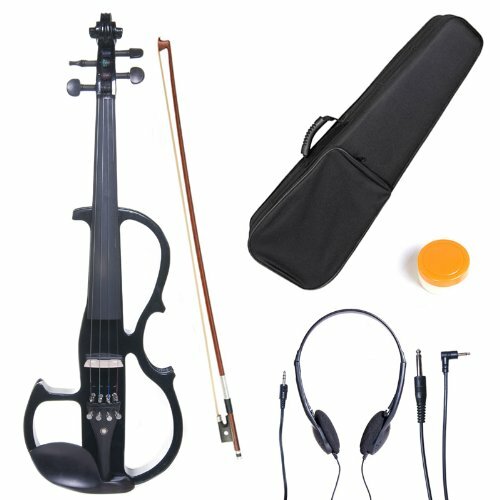 Electric violins are heavier because of the added electronics and cables. Your child might also require more assistance, which can be discouraging for eager learners. More sound options and features, like lights or a foot pedal. A brighter sound, good for the rock or jazz genres. Brazilwood: Commonly used for beginner bows. It’s durable and flexible. Pernambuco: For professional bows, a dense wood with perfect elasticity. Mongolian horsehair: The most common; it’s inexpensive with average elasticity. Siberian horsehair: For high-end bows, this hair is thicker and has more elasticity (source). A case: It’s crucial to store the violin away when not in use. Instruments don’t always come with cases; you might have to purchase this separately. Cleaning: Accessories include string cleaners and a polishing cloth. Consider buying a kit to get all the essentials. A humidifier: Violins are the best stored at 45 to 60 percent humidity (source). Extra strings: Expect to change them every three to six months (source). By now, hopefully, you’ll have a better understanding of how to buy a good violin for your child. Next, you can consider our top nine for a little extra guidance. Maybe you want something a bit more realistic-looking for your music-loving tot. At an early age, you want your child to get to know the instrument: the size, position, and feel. This toy violin doesn’t look so “toyish,” and sits between 16 and 17 inches tall, about the size of the 1/8 violin. It’s battery operated and comes with a bow. Your toddler can play along to 25 familiar nursery rhymes. These include “Mary Had a Little Lamb,” “London Bridge,” and more. This isn’t suitable for children under 3 years old, as it comes with small parts. 25 melodies your child probably knows. There is no “off” switch for the melodies. Parents found it to be a little unresponsive at times. Colors are an essential part of a child’s life, therefore, why not find a colorful toy violin? 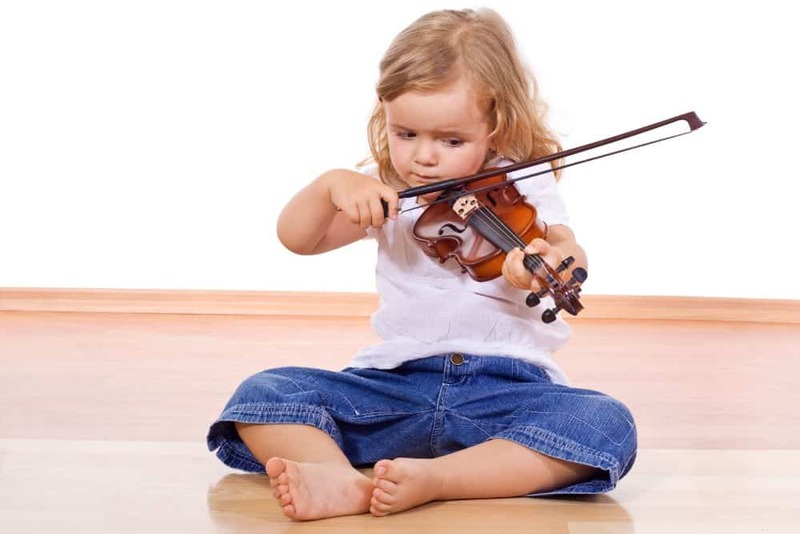 Giving your toddler a violin toy to play around with could encourage them to learn later on. The one we found here comes in two colors: blue and pink. It’s highly durable and should be able to take a few hits without breaking into pieces. It’s also easy to figure out for developing minds. All your child has to do is move the bow across the pad on the violin. Different notes and songs can also be played. Not suitable for children under three. Some parents found the bow to be too fragile. It might not be the best idea to hand an expensive violin to a toddler. Even the most careful tot can have accidents. But your child might still show a lot of interest in the art. This one is 17 inches long, which is ideal for the average sized toddler. The violin toy is powered by batteries and has seven classic songs your child can play along to. These include beloved songs by Bach, Mozart, and Paganini. If your little one wants to create their own music, they can simply press the buttons on the fingerboard. There aren’t any strings, but this toy is focused instead on providing them with a feel for the movement and positioning of the violin. Classical music to play along to. Your child can create their own tunes. It sounds more realistic than other toy violins. Some children found it challenging to use the bow. Parents said their child lost interest quickly. This Mendini 1/2 acoustic violin has a beautifully contoured body that will help your child get a good feel for the instrument. It’s made from maple wood and has a spruce top, giving it a warm, bright acoustic sound. Two larger sizes are also available. Your child can also make quick adjustments to the tuning. The tailpiece allows for much finer adjustments as well. 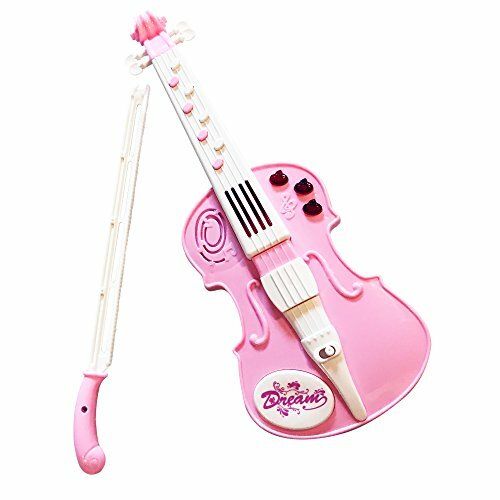 Your budding violinist will also receive a “92D” chromatic string tuner, for help getting the notes just right. It comes with a lightweight hard casing to keep the instrument safe when not in use. 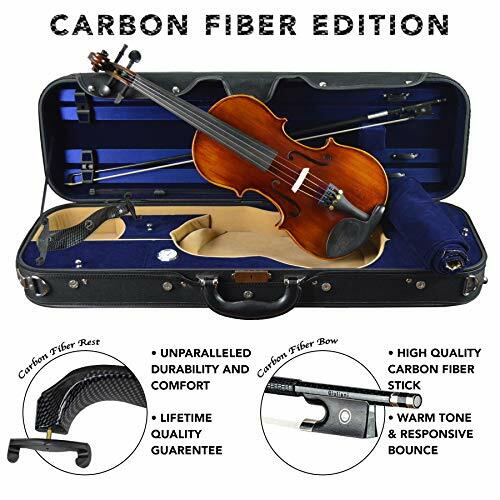 This package includes a rosin cake (a block of resin rubbed on bow strings to facilitate grip), extra strings, two bridges, a shoulder rest, and a bow. The bows are made of Brazilwood and real Mongolian horsehair. The shoulder rest will help your child maintain good posture while playing. This will also make long hours of practice more comfortable. Everything you need in one purchase. Good quality violin with a beautiful sound. Parents have mentioned the strings are not the best quality. If you want to give your child a great headstart in the art of violin, they should have a high-quality instrument. Kennedy violins are finished by professional “luthiers,” or violin builders, in Washington. They’re made of maple and spruce woods, providing a smooth sound. The sides of the violin are also carved, as opposed to being pressed by machine. The fingerboard and pegs are polished ebony. The whole violin has a satin finish, instead of an oily lacquer which can alter the sound. 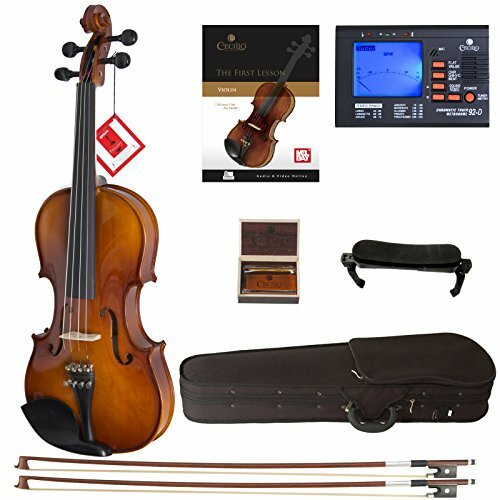 This violin is 1/8 size, which is the smallest size available from this producer, but you can choose between four other sizes as well. The bow is made out of Brazilwood and fitted with 100 percent Mongolian horsehair. It also has a leather grip for a comfortable play. The case that comes with this violin will fit everything inside. It has a velour lining and large accessory compartments. There are velcro closings and a hygrometer so you can check the humidity. Comes with accessories including hygrometer. Some parents found cosmetic flaws on the body. For young beginners, it might be a good idea to invest in a violin package. These typically include a case, one or two bows, rosin cake, and maybe extra strings. 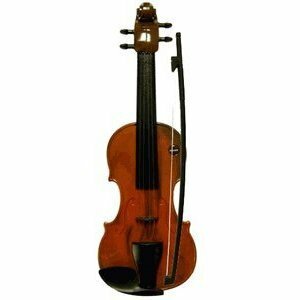 Here, your child will receive an acoustic 1/4 violin (you can also select bigger sizes if desired). It’s made from a combination of durable woods such as spruce and maple. The bright, open, and very smooth sound makes it suitable for beginners getting used to the violin. The fingerboard is ebony as well as the pegs and chinrest, making it nice and comfortable for young hands. Two bows are included and are made of Brazilwood and real Mongolian horsehair. You’ll also get an adjustable shoulder rest, extra strings, rosin cake, and two bridges. Comes with essentials and extras. Some parents found the rosin cake to be a bit old and dry. As your child advances and begins to discover “their sound,” it might be a good time to step away from the acoustics and try something different. This hand-carved electric violin is made from durable maple wood. It has ebony pegs, chinrest, and fingerboard. The design of the body is very unusual and slightly avant-garde looking. It’s powered by an alkaline battery which can be recharged. Your child can also plug in headphones for personal practices and to spare everyone else! It comes with a lightweight case, rosin cake, and a Brazilwood bow with Mongolian horsehair. There’s also a bridge to help keep the strings extra tight and an AUX cable. Can be hooked up to a computer, speaker or guitar amplifier. Headphone jack for quieter practice sessions. Parents found it to be a bit heavy. This acoustic 1/4 violin is made from maple wood with a spruce top. It has purfling lining, or decorative edge, to give it that classic look. It also has an antique varnish which will help keep the instrument safe from environmental damage. The fingerboard, pegs, and chin rest are made of ebony. The tailpiece is fitted with four nickel-plated tuners, which can help your child tune the instrument. It comes with D’Addario Prelude strings. It’s a highly responsive violin, meaning it’s easy to play without too much pressure. The sound is smooth and warm. 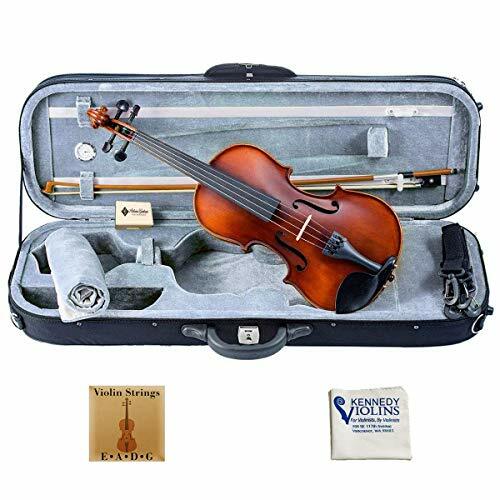 Your aspiring violinist will also get a lightweight hard case to store the instrument whenever not in use. 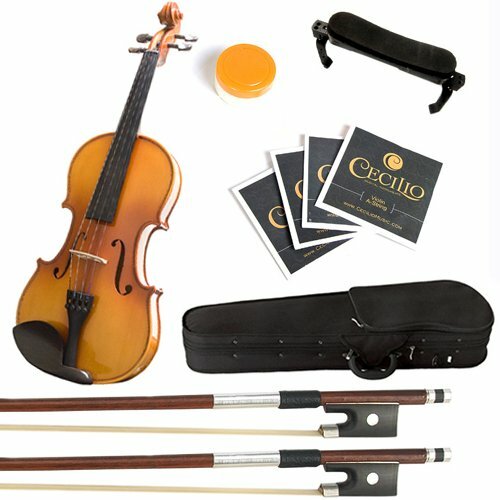 The package includes two bows with Mongolian horsehair, rosin cake, adjustable shoulder rest, and an additional bridge. High quality wood and materials. Parents have said the violin is excellent, but the quality of the accessories isn’t so great. For this piece, we must revisit Kennedy violins. There’s a good reason for that as they offer high quality for the price range. This Louis Carpini has a warm tone with good resonance. It’s an acoustic 4/4 hand-carved violin, made from maple wood with an ebony chin rest, pegs, and fingerboard. At the bottom, there are also four built-in tuners at the tailpiece. These will enable your child to make even finer tunings. 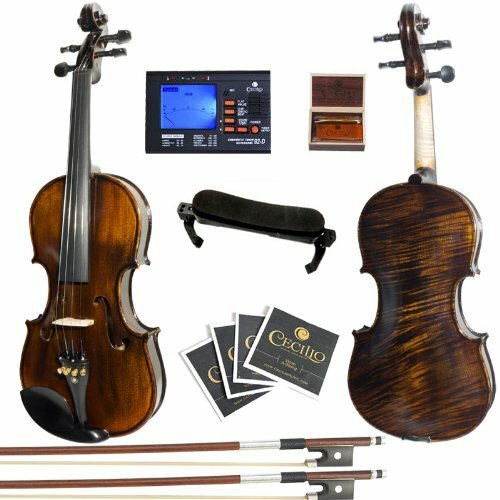 Your child will get one Brazilwood bow as well as a hand-carved French Aubert maple bridge and D’Addario Prelude strings. As with the previous Kennedy, this one comes with the same type of casing. You can choose between three colors: blue, red, and green. The case can hold four bows with extra pockets for sheet music. It also has a sturdy zipper and a latch to keep everything in place. Parents found the rosin included to be low quality. The violin is not only an instrument, it’s an art. Making the decision to let your child play could be life-changing for them. The violin is also so much more than classical music, so encourage your child to find their unique sound and style as they advance. Our favorite would have to be the Cecilio Electric Violin. It looks stunning, and it’s suitable for children who enjoy modern music. Do you know how to play the violin? What is it about the instrument that interests your child? Share a few comments below!